When we think of Japan, the first thing that comes to our mind is sophisticated and advance technology, fastest bullet train, clean and safe environment and hardworking and polite people. Japan is a warm, welcoming and endlessly interesting country. Also with its’ growing employment opportunities, Japan is the country to look for. 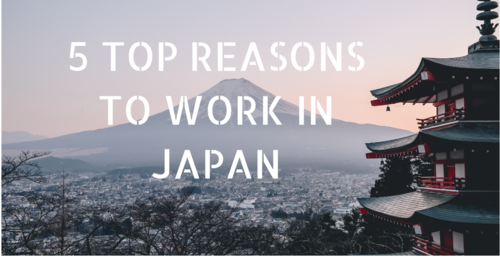 If you are thinking to work in Japan, we present you Top 5 Reasons to Work in Japan and assure you why that’s the right decision. Technologically most advance country – Japan, is undoubtedly the most technically advanced country. It will inspire you and same time amaze you. It will ease of your daily hassles. If you are a technology student, a professional working on the most advance technology and upcoming gadget will be your dream come true. Japan is a global centre of excellence - We all know, how Japan has rebuilt itself over and over again. Japan has proofed to be a leading force for research and development in many industries – from engineering and pharmaceuticals to robotics – and also has a strong academic community with a driven spirit as evidenced by its 26 Nobel Prize winners. Job Stability and decent employee perks – Japanese company believe in Kaizen, continuous improvement, so they don’t fire employees that often. Even in economic downfall, they try to cut down on expenses instead of people. They understand that the economy is cyclical, and they want to keep their people around for when it picks up again. Apart from job stability, Japanese company also offer decent employee benefits like medical care, pension, some cases travelling too. Clean and safe environment – Japan offers a clean and well-organised environment. It enhances your life experience. Also, Japanese people are harmonious and avoid conflicts, it is a perfect place to settle in, even with your family. Huge opportunity in every industry - With the government encouraging foreigner to work in Japan, there is better pay and reduced immigration formalities.As Japan is focussing on advance technology, they are planning to hire more than Technology graduates from Asian, especially from India. Apart from these top reason to work in Japan, Japan also offers a unique experience like mesmerising natural scenes, fresh sushi, amazing train rides, intriguing traditions and quirky pop culture which makes living in Japan way more fun than other countries.